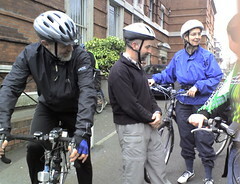 A group of 13 cyclists and a baby met up at the Old Town Hall at 11 am. Early arrivals had coffee with James. 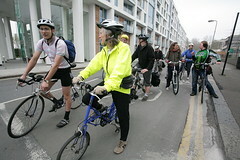 We were pleased to meet up again with people we’d met on the Sheldon Brown memorial ride. Marta and Arthur from Poland and their accommodating baby daughter Alicia who rode on Marta’s rack, receiving an occasional feed and nappy change. Most of the photos were taken by Arthur on Marta’s magnificent digital SLR camera. 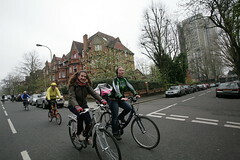 Neil who had already done a time trial earlier that day and Anna an Erasmus student from Italy. 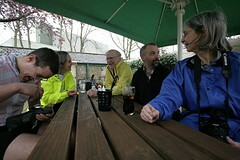 The CCC committee and partners were well represented by John and Ellen, Meade, George and Jean as well as James. 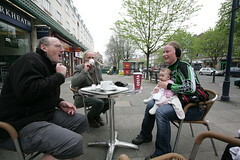 We were joined by Graham, Tony and Clive – we’d met some of them before on the ride on the Heath or on the ride to the Olympic site. After a week of bad weather, the very heavy wind had dropped and we set off down the hill with a helpful mild tail wind. 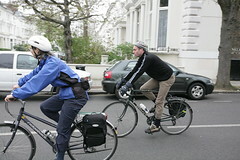 We followed one of James’ back street routes via Maida Vale and Paddington, arriving eventually at Hammersmith Bridge. We crossed to the south side an gathered on the towpath where we met up with Eleanor from Waterloo and for a short while, her brother. We posed for the group picture before moving on. 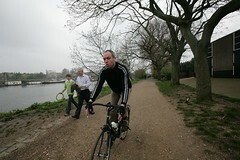 We rode the towpath through Barnes and into Mortlake. Some of it was a bit boggy, but nobody fell off. 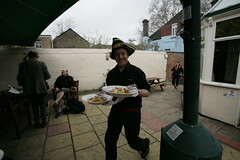 At Mortlake we stopped for lunch at the Ship Inn. We sat in the garden enjoying the rest, but people seemed to think the beer wasn’t up to its usual standards although the landlord made some efforts yo amuse us with his 3-cornered hat. 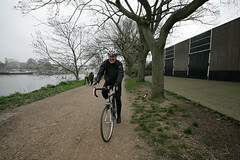 After lunch we rode on the towpath, past Kew to Richmond, pausing for a while before attempting to assail the steep Nightingale Lane on the way into Richmond Park. 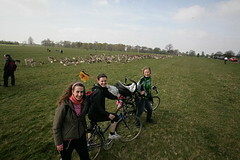 We really enjoyed the ride through the park and seeing the deer. 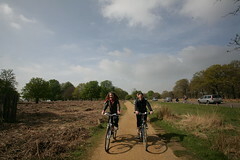 We rode to the far side of Richmond Park, through a culvert under the A3 and onto Wimbledon Common where we stopped for a tea break at the Windmill. 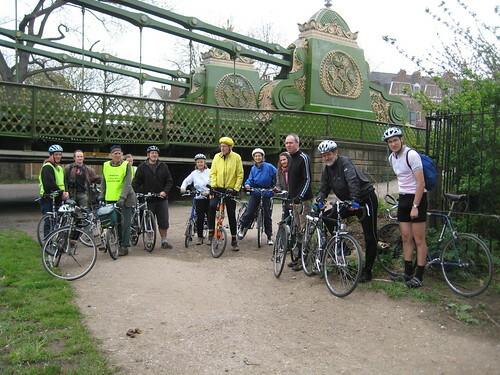 James planned to take us back via the Wandle Trail, but although the trail was only reinstated a few years ago, a vital connection under a railway was blocked up. 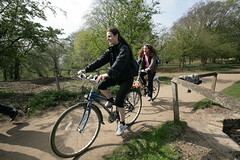 We had to make a diversion via Tooting but then rode Wandsworth Common, Clapham Common and Battersea Park. We posed for a photo by the Peace Temple. It suddenly snowed for a few minutes but then stopped. 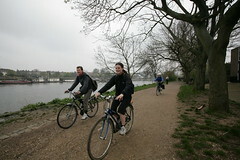 We set off again and Eleanor left us at Battersea Bridge toreturn home to Waterloo. 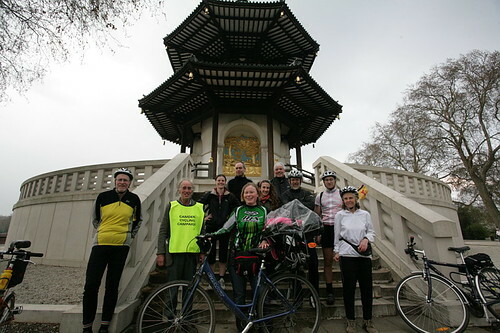 The rest of us went over the bridge, through Hyde Park and back to Camden.